Europe’s Space Program: Will Vega Ever Take Off? These days practically all serious economic decisions are politically motivated. More than in any other sphere, this is the case in the extremely resource-consuming and knowledge-intensive aerospace industry. The European Space Agency’s project to create the Vega light launcher is a vivid example of a commercially hopeless but politically expedient initiative. The original idea was not bad: seven aerospace industry leaders – Italy, France, Belgium, Spain, Sweden, Switzerland, and the Netherlands – jointly planned to develop an ultramodern space system for commercial use in the interests of Europe. Thus the EU was going to get an independent gateway to space and to benefit from it financially. It transpired, however, that politically adequate decisions and loud initiatives do not necessarily guarantee success even when they are backed by powerful administrative resources. The technical specifications of the planned launcher are not exactly at the modern level, and the integration in the Old World could still be tighter. The Vega project was officially endorsed by the Council of the European Space Agency in June, 1998, but the funding remained limited to its first phase. Though it was originally planned that Arianspace (France) would play the leading role in the project, by 1999 France supplied only 8% of the money required, while Italy, for example, already provided 55%. Further steps required the endorsement of the project at ministerial level of the European Space Agency’s member countries during the meeting in Brussels in May, 1999. At that time, however, an agreement was not reached due to disputes over the shares of various countries in the program. The period of uncertainty that ensued bred a series of talks aimed at searching for compromise. Eventually, consensus was reached and the efforts in the framework of the light launcher project were revived. However, after this the progress of the project was still impeded by France. At a certain moment it intended to withdraw its share claiming that the Vega project would not be able to compete with other launchers which were already in use, such as Russia’s Rokot . The main source of difficulties encountered by the Vega project was the approach of the European Space Agency which allocates industrial contracts proportionally to the financial contributions of the respective countries. The position complicates the implementation of high-tech projects and creates tensions among national agencies within the European Space Agency. It was announced initially that the first launch would take place in 2002. Subsequently it was postponed till 2006, 2007, and 2008. 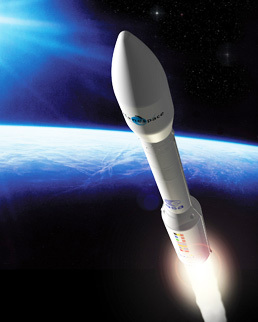 Arianespace CEO Jean-Yves Le Gall told on July 22, 2008 that the first Vega launches would take place in late 2009 and admitted that certain technical difficulties arose in the process of creating the launcher. He also said that the work slowed down due to the competition between the companies involved. It is already 2009 but the project is at a standstill. In the meantime the total lack of coordination among European aerospace companies is forcing potential clients to switch to alternative launchers. Pertinent political measures failed to help out Vega. The EU and European Space Agency administrations notified all European customers harshly that they should use the launcher being created to deliver their payloads to space. However, while the customers’ projects await implementation the countries involved in Vega continue to disagree over paying for the work done while time is passing by. Germany turned away from Vega and switched the SAR-Lupe to Russia’s Kosmos-3M. Even a number of joint projects operated by the European Space Agency now rely on the Dnepr rockets. Aware of the problems with the implementation of the project, the European Space Agency employs Russia’s Rokot space launcher as the official backup for Vega, which is an indication of Europe’s not being confident that its own light launcher will be ready for use within a reasonably short period of time. There are reasons to expect that as more European satellites are ready to be launched the European Space Agency will have to put them into orbits with the help of competing vehicles. On the one hand, the process will undermine the trust in the new launcher, and on the other – expose the inefficiency of the protectionist policies adopted by the EU and the European Space Agency in the framework of the Vega project. Another headache associated with the new launcher is the debris problem. The projection based on the examination of the planned slopes of the Vega trajectories is that the debris are going to land in Europe’s densely populated regions. Currently the problem is hushed up, but its existence is obvious to experts and this fact alone has made it impossible for the attractive joint space project called Vega to materialize.